The NDFM is a single, national system that provides estimates of the total quantity of daily travel demand produced by and attracted to each of the 18,488 Census Small Areas. Trip generations and attractions are related to zonal attributes such as population, number of employees and other land-use data. 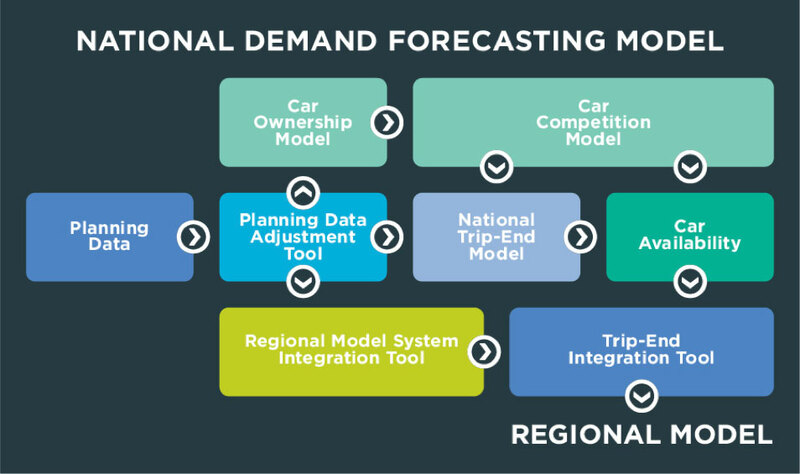 The National Demand Forecasting Model (NDFM) provides input into the regional models & interacts with a number of key regional model components. The NDFM utilises planning data to output levels of travel demand at the smallest available spatial aggregation (Census Small Area) for input into each of the Regional Models. This demand is derived using a number of modelling components. NDFM includes the set of models and tools used to derive levels of trip making from planning data for input to each of the regional models. The National Trip-End Model (NTEM), which converts the planning data into person trips, using the calculations described in this report. NTEM estimates the total daily intra-region travel demand. In practice NTEM generates the demand for travel nationally at a highly disaggregate level (Census Small Area) and this is adjusted to the intra-region demand by the RMS. This is achieved in two stages, firstly by aggregation of the Census Small Areas to zones using the appropriate regional zone system and secondly by subtraction of the movements generated by RMSIT. The Regional Model Strategic Integration Tool (RMSIT), which estimates the level of trip-making by main mode (car, bus, rail and goods vehicles) between 38 of the main urban settlements in Ireland. This provides external demand that is consistent across the regional model boundaries. The RMSIT generates long distance movements by private car, PT and HGV and ensures consistency across the regional model boundaries for traffic moving into and out of each region. There are several stages to the NDFM but the two which are important for the RMS are the Regional Model Strategic Integration Tool (RMSIT) & the National Trip End Model (NTEM). RMSIT generates long distance movements by private car, PT and HGV and ensures consistency across the regional model boundaries for traffic moving into and out of each region. NTEM estimates the total daily intra-region travel demand. In practice NTEM generates the demand for travel nationally at a highly disaggregate level (Census Small Area) and this is adjusted to the intra-region demand by the RMS. This is achieved in two stages, firstly by aggregation of the Census Small Areas to zones using the appropriate regional zone system and secondly by subtraction of the movements generated by RMSIT. More information is available in the NDFM report which is available on request. The NDFM uses planning data to derive levels of national levels of trip making for input into each of the regional models. The Planning Data Adjustment Tool (PDAT) controls the planning data inputs in the core NDFM system, and is used to amend planning data to represent the combination of general changes over time and the relevant land-use planning scenarios. The Car Availability Model, which classifies the set of individual person trips as either ‘Car Available’ or ‘Car-not-available’. The car availability model determines the proportion of people in each demand segment who have a car available for their specific journey. The model uses a mathematical function to calculate the output based on the trip purpose, home location, gender and car competition. Households with at least as many cars as adults. This data is provided for each CSA and is a key input to both the Trip End and Car Availability models. A disaggregate model which determines levels of car competition within each CSA based on the demographic and economic factors specific to the area. The National Trip End Model (NTEM) component of the NDFM suite derives trips by purpose associated with each CSA based on various zonal attributes such as levels of employment, population, etc. and applying coefficients. Establish the number of non-home-based trips. The Regional Model Strategic Integration Tool (RMSIT), which estimates the level of trip-making by main mode (car, bus, rail and goods vehicles) between 38 of the main urban settlements in Ireland. The main aim of the RMSIT process is to determine the number of trips travelling between each of the regional models. 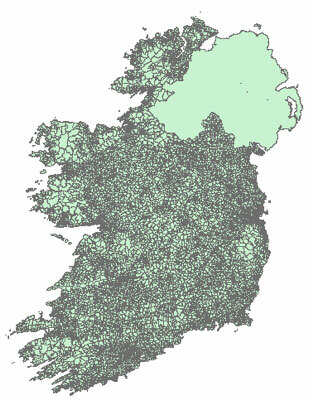 The model works by predicting the demand (by mode) between each of 38 major settlements across Ireland (including some in Northern Ireland). The model then works out which Settlement-to-Settlement trips would start, end, or pass through each of the regional models. The demand matrices are then converted into a format which can be used by each of the regional models. This involves aggregating demand from settlements outside of the regional model into the “route zones” located at the edge of the model. Within the modeled area, the demand to “internal” settlements must be disaggregated to the regional model zone system. This process is done differently for each mode to reflect the likely destination of trips (e.g. trips by rail are likely to have destinations near a train station). Why was the RMSIT developed? In the Regional Models, away from urban centres and in areas close to the boundaries of the modelled areas, the models do not represent trips and travel patterns in the same level of details as at the urban centres. For each of the 5 regions, the demand model only produces trips for internal zones which have full connectivity to all other internal zones within each model region. However, this means that, for example, a zone at the boundary of the model is only connected to other zones within the model area, but unconnected to any zone which is outside the model area. Therefore, not all trips from this zone can be represented. In particular trips moving between zones at the model boundary and the associated assigned network flows are not modelled with the same level of accuracy as trips moving between zones that are internal to the modelled area. Since the issue of not having full zonal connectivity exists for any trip crossing the model boundary, another system has to be developed that includes connectivity for trips between points where the ends of the trip are in different model areas. This is the critical function of the RMSIT, which must also maintain consistency with the National Demand Forecasting Model (NDFM). An Inter-Regional Travel Model (based on a pre-existing tool called the Corridor Prioritisation Tool). A Cube Voyager Integration Process (a standalone application that converts outputs of the Inter-Regional Travel Model into a format that is suitable for assignment in each of the 5 Regional Models. The RMSIT Development Report is available on request. The Trip End Integration module converts the 24 hour trip ends output from the NDFM into the appropriate zone system and time period disaggregation for use in the Full Demand Model (FDM).